Not that I'm selfish or anything. One of my go-to sites for the last 10 years has been epicurious.com; epi was doing social media and web 2.0 before any of us even knew what that was. When I first discovered them (and I've been saving recipes since 2001 on there), I loved it because I could see feedback from other people who'd made the recipe (i.e., they allowed comments; nobody else was doing this back then). I could see reviews from people who'd made the recipe, and best of all, I could save everything in my own personalized recipe box. Now, pretty much every site (including this one, naturally), allows comments. And with Pinterest, we've pretty much eliminated the need for a site-specific recipe box (though I will continue to use epicurious!). And there are hundreds of thousands of blogs and cooking websites out there. And with this overwhelming amount of choice, it can actually be a bit intimidating to start a recipe search. So with that in mind, and despite all this endless choice, sometimes I still retreat to my trusty cookbook shelf. It's not a huge shelf, and I don't let just anyone have shelf space, but I have a few tried and true cookbooks that I keep around because they are fabulous. One such pair is Clean Food and Clean Start (Terry Walters). These are seasonally-based vegan cookbooks using natural, healthy ingredients. First, I love the covers (which is shallow, I wholeheartedly admit, and it looks like the revised edition of Clean Food has a photographic cover, rather than the solid green cover with the half-jacket of the original edition, but the originals are pretty and I like them). I also love the seasonal approach to cooking, using what's best from each season. These aren't generally the recipes I serve to guests, as they do tend to have that distinctive wholesome flavour that is not necessarily universally enjoyed (but I love). Anyway, bottom line, before I ramble too much more, these are great cookbooks for when you want to feel good about what you're eating. 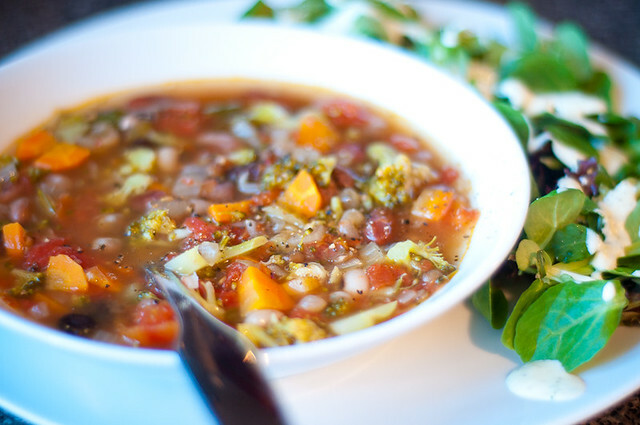 So I took inspiration from the hearty minestrone recipe in Clean Start, and went from there. My version was not vegetarian/vegan, because I used a combination of chicken/beef broth (it's what I had). Obviously, this is a very simple substitution. 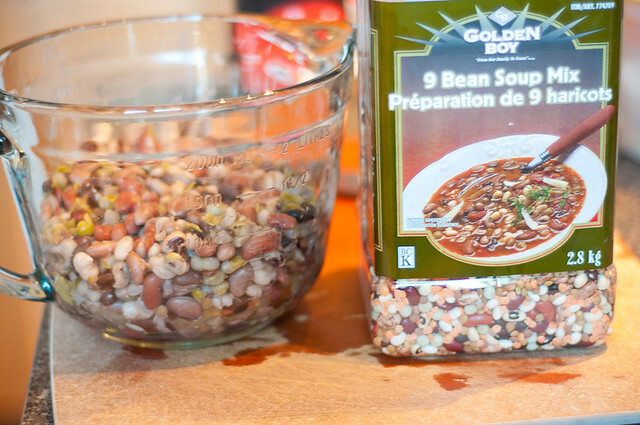 I used different beans, because I have a massive container of 9-bean mix that I got from Costco. I just soaked them the night before and let them bubble away for about an hour during the afternoon. Nothing wrong with canned beans either though. ;) 1.5 cups of bean mix made about 4.5 cups of cooked beans. And my salad dressing is not vegan either, but it's really darn good, so you should make it. I have a hard time with bottled dressings now; I do generally keep a bottle or two in my fridge for when I'm feeling really lazy, but I find the saltiness and added flavourings are just overpowering. 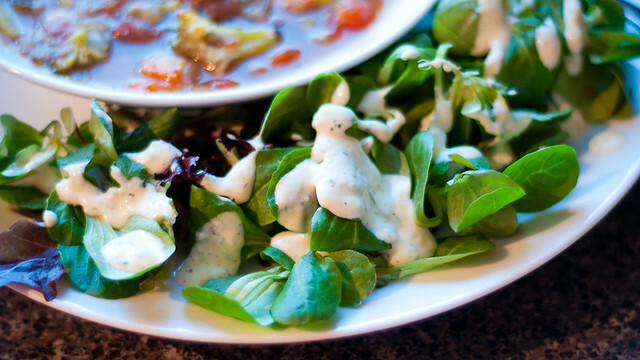 Nothing like the pure deliciousness of homemade salad dressings, bright and fresh with herbs and garlic. 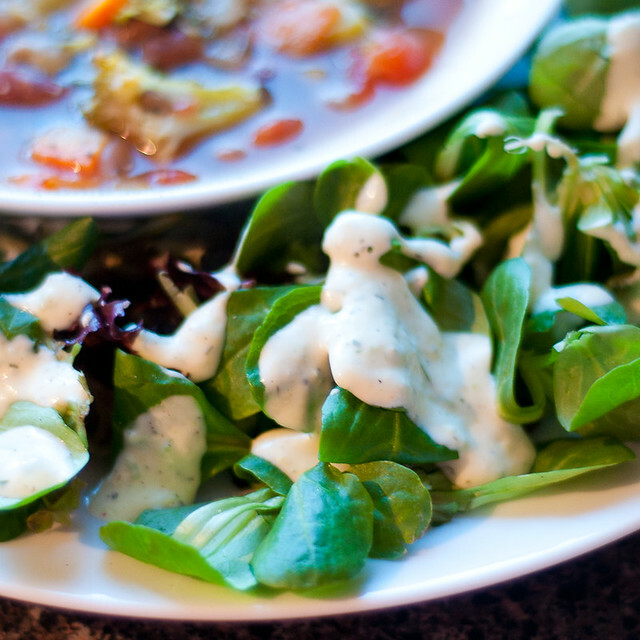 Also, I had buttermilk that needed using up, so this homemade buttermilk ranch dressing was a great way to do that. (3 stalks celery, diced) --> I was out! 1. In a big soup pot, sauté onion, celery and carrot of medium heat, about 5 minutes. 2. 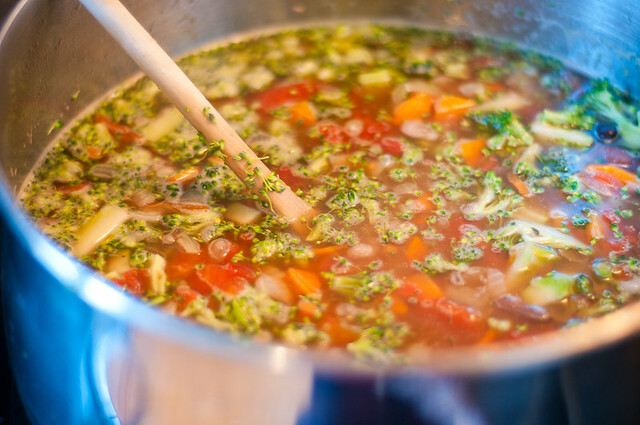 Add tomatoes, beans, broccoli, stock, green beans/greens, balsamic vinegar, bay leaf and herbes de provence. And lots of pepper. 3. 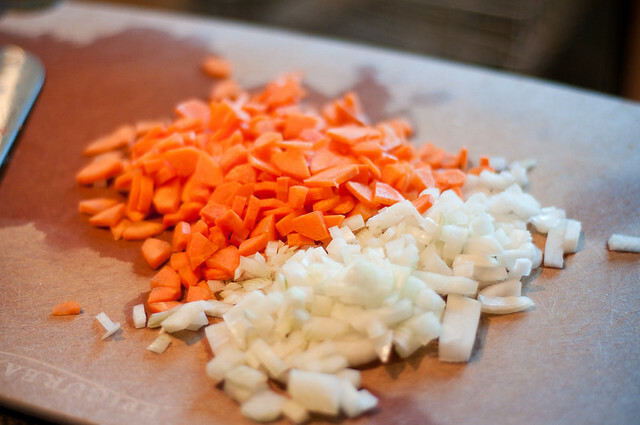 Bring to a boil, reduce heat, cover and simmer about 30 minutes (until carrots/celery are done). Remove from heat, discard bay leaf and season to taste with salt and pepper. 1. 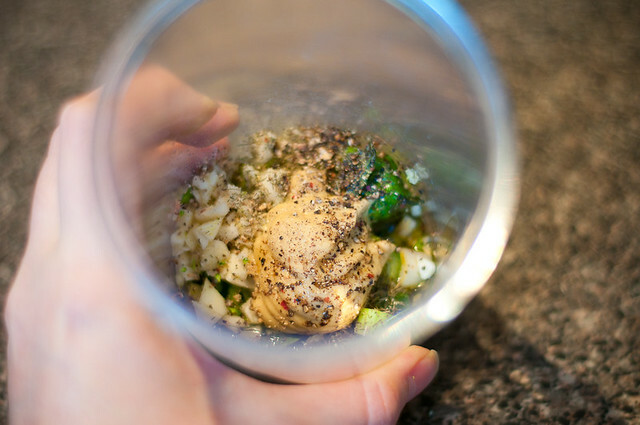 In a food processor/immersion blender, combine the onions, basil, dill, lejon juice, dijon, olive oil, garlic, salt and pepper. Process until relatively smooth. 2. Add mayo, miracle whip, greek yogourt and buttermilk. Process again. Taste, and use on salad, or as a dip. It's super yummy! I had mine on a mâche mix, but it would be good on anything. The recipe makes about 2 cups. Hubs and Lil Z had theirs with garlic toast (SO EASY - make toast, rub with fresh cut garlic. Voila. Garlic toast. ), but I just stuck with the soup and salad. It was hearty and filling and I'm very stoked to eat more of it for my lunch today.